Who wants store bought pop tarts when you can make your own right at home? These flaky pop tarts are stuffed with a decadent nutella filling, covered in a sweet vanilla icing and decked out to delight even the pickiest goblin or ghoul in your life. In a large bowl, stir together the flour, sugar and salt. Add the cubed butter and beat until the mixture resembles course sand. Add the ice water one tablespoon at a time until the dough comes together. You may not need all four tablespoons. Divide your dough in two, flatten into discs, wrap in plastic wrap and allow to chill for 45 minutes to an hour. Roll the first ball of dough out onto a light floured surface until it’s approximately 9″x12″. Using a large cookie cutter, cut out 8 ghosts. Spoon a couple teaspoons of nutella or another kind of filling onto your ghost cutouts and gently spread it out. Make sure there’s about 1/3″ of open space around the edge of your pastries. Roll out the remaining dough and cut out 8 more ghosts. 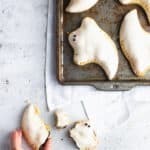 Using your finger, wet the edge of the filled pastries with some water, cover with another ghost cutout and gently press the edges together. Use a fork to seal. Poke a few air holes into the top of your pop tarts with a fork. Bake at 350F for 30 minutes, or until the pop tarts are golden brown. Dip each pop tart into the glaze, gently shaking it to allow any excess glaze to drip off. Be sure to stir the glaze between each pop tart so it doesn’t form a crust. Immediately add two black nonpareils to each pop tart for eyes. Once the glaze has completely crusted over (about 30 minutes) use the pink powdered food coloring and a food-only brush to add rosy cheeks. If you’re making your pie dough from scratch, don’t skip the refrigeration step. Fun fact: refrigerating your dough for at least 30 minutes allows the gluten to relax and the fat to firm up resulting in an extra-flaky texture. Want to make your pie dough ahead? You can make it and refrigerate it up to 2 days. Be sure not to overfill your pop tarts. I know it’s nutella and we can never get enough, but overfilling will lead to your filling oozing out the sides and potentially ruining your seal. A couple teaspoons is more than enough. Why we cook the glaze: You may be wondering why we’re cooking the glaze. After all, there are lots of doughnut recipes on the web that don’t require this step. Here’s why: cooking the glaze causes a chemical reaction that results in a glaze that hardens quickly and becomes a shell (rather than a soft glaze). It’s perfect for locking in moisture and making life easier if you need to pack these pop tarts. Leftovers: Leftover pop tarts can be stored at room temperature in an air-tight container. To reheat, simply microwave them using 10 second increments until warm. DO NOT put these in a toaster.